Can you see her? Female cardinals are not nearly as bright as their male counterparts. She is more grayish brown but has the same orangy yellow beak. While friends of mine have said the cardinals come right up to their windows, we have a pair that are very skittish and this is as close as they get...about 20 feet from the back of the house. She is sitting on one of the shrubs that I've mentioned are a favorite target of the deer. These are still recovering from a huge deer munchfest from two years ago. 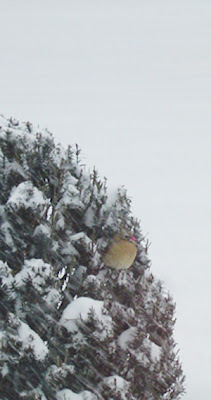 We have five feeders with seed and one with suet that I have hanging from the eaves so that they are just on the other side of the windows in the sitting room. My mom was always a bird watcher so this is a passive activity that she can enjoy.